This calf-length dress was knitted in just two pieces from Spintex, a wool and rayon blend. The draped top with cap sleeves and knife-pleated skirt have been grafted together at the waist. The resulting seamless garment is very comfortable to wear. Maria Luck-Szanto was inspired by stitches used in Victorian patterns for waistcoats which she found in the National Art Library at the V&A. The post-war New Look pioneered in Paris by Christian Dior in 1946 featured voluminous skirts using many yards of material. However, in Britain clothing and textiles continued to be rationed until 1952. Here Luck-Szanto uses the knitted-in pleats of the skirt to give the impression of fullness. Green half-length dress, knitted from a wool and rayon fancy yarn called Spintex. 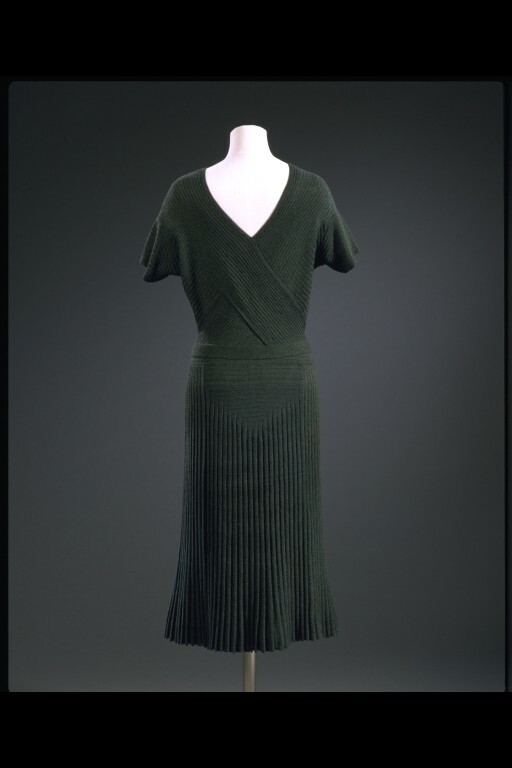 It was knitted to shape in two separate pieces, the draped top with cap sleeves and the pleats skirt, which were subsequently grafted together at the waist. The pleats of the skirt are knitted in. The dress has a matching belt knitted in ribbing. In 1935 Maria Szanto moved from Vienna to London, where she ran a successful hand-knitting business until the early 1960s. She employed several hundred outworkers; a large contingent were seaside landladies pleased to earn an extra income during the quiet winter months. The knitter of this dress was Mrs Doris Elvin. This design was included in a special show of Szanto models held by the International Wool Secretariat in 1946. Like many of Mme Szanto's best designs it remained, with minor modifications to hem length, neckline, etc, in demand by her sophisticated clientele well into the 1950s. Dress of hand knitted wool and rayon 'Barbara', Maria Szanto, England, early 1940s. Accompanied by unreg white petticoat. 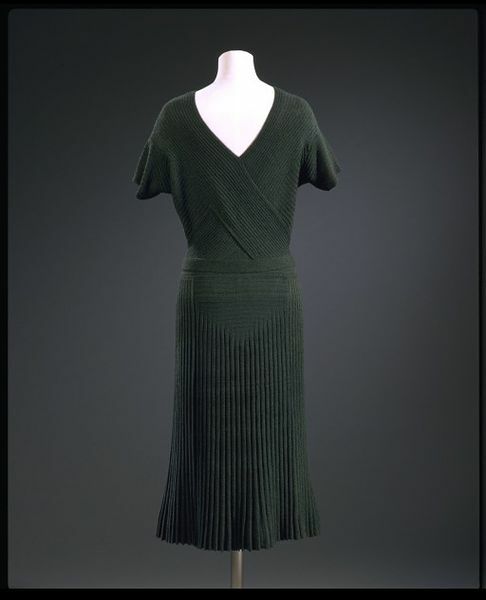 This calf-length dress was knitted to shape in just two separate pieces - the draped top with cap sleeves and the knife-pleated skirt - which were subsequently grafted together at the waist. The result is elegant, well fitting and with no seams to restrict movement, extremely comfortable to wear. The pleats of the skirt are knitted in. The dress has a matching belt knitted in ribbing. In 1935 Maria Szanto had moved from Vienna to London, where she ran a successful hand-knitting business until the early 1960s. She employed several hundred outworkers; a large contingent were seaside landladies pleased to earn an extra income during the quiet winter months. This dress was knitted by Mrs Doris Elvin.